Brian O'Callaghan Westropp collecting money for Blood Bikes East. VOLUNTEER COLLEAGUES OF the Irishman who died in wildfires in Greece have described him as “a diligent colleague and dear friend”. Brian O’Callaghan-Westropp was on his honeymoon when he and his wife Zoe Holohan were caught in the fires, which have claimed over 80 lives. The two were married last week. The two became separated as they tried to escape the fires in the coastal town of Mati. Holohan is being treated in a nearby hospital. The death of the newlywed was confirmed yesterday by the Department of Foreign Affairs with his family saying they were “deeply saddened” and were requesting privacy. O’Callaghan-Westropp was originally from Killaloe in Co Clare but lived in Dublin. 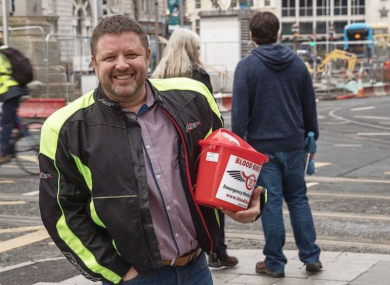 He was a motorbike enthusiast and was a volunteer with Blood Bikes East, a charitable group which transports medicines and other supplies between hospitals in the Dublin region. RIP Brian O’Callaghan-WestroppWe are beyond devastated at the confirmation that the fires in Greece took Brian from us. A diligent colleague and dear friend, we will miss Brian’s huge personality and infectious smile. His no-nonsense, can-do approach to the work of volunteering meant that he helped BBE to become the professional organisation we are today. Despite it being a year and three months as a BBE Volunteer, it feels like he was involved for so much longer, and his influence will last for decades to come. Thank you Brian for everything, you leave us bereft but better for having known you! Rest in peace now our friend, your work is done. Finally, we send our deepest condolences to Zoe, his wife, and his family and friends. Minister for Foreign Affairs Simon Coveney was among those who also sent condolences to the deceased man’s family. I am deeply saddened at confirmation of the death of an Irish citizen in Greece. This is such a terrible tragedy, my thoughts are with the families and friends who have requested privacy. Officials at our Embassy in Athens will continue to provide every possible assistance. Family friend and chaplain at Athlone IT told RTÉ’s Morning Ireland that Brian’s death is not the first time his mother Rosemary has experienced tragedy. Fr Shay Casey spoke about how she lost her other son Colin to a motorbike accident in 1997 when he was in his early 20s and that the boys’ father also died when they were young. Despite this, he said both brothers had loved life. They’re terribly outgoing, enthusiastic and full of life, he just took it by the scruff of the neck. Did everything with a full heart you know and just got on with it. Saw the needs of everyone about them. If he saw someone in need, he wouldn’t be slow to help them and just a very generous soul. That’s how they were reared, that’s the way Rosemary wanted them to be. The Greek-Irish Society has also expressed its condolences with the family and friends of Brian O’Callaghan-Westropp and “to all the other families of the victims of this disaster”. The group is also appealing for donations to assist the families and loved ones of those affected by the tragedy. Details of how to make donations to that fundraising effort are available on the group’s Facebook page. Email “Irishman who died in Greek wildfires praised for his 'no-nonsense, can-do' charity work”. Feedback on “Irishman who died in Greek wildfires praised for his 'no-nonsense, can-do' charity work”.